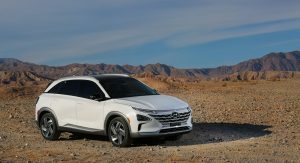 Hyundai introduced the 2019 Nexo at CES last year and now the company has delivered the first model to an American customer in Van Nuys, California. 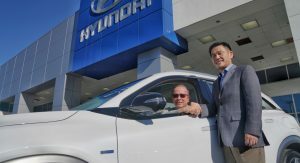 Besides announcing the delivery, Hyundai revealed the crossover will have a base price of $58,300. That undercuts the Toyota Mirai by $65 and that’s before incentives from the state of California which are worth up to $5,000. 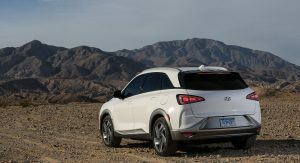 The good news doesn’t stop there as Hyundai will provide the first year of maintenance for free. 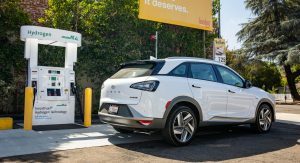 Buyers will also receive up to $13,000 worth of hydrogen refueling cards which can be used within the first three years of ownership. 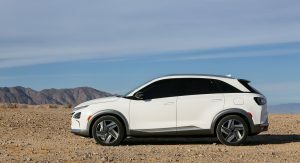 Customers looking to lease aren’t out of luck as they can get the Nexo Blue for $399 a month for 36 months. 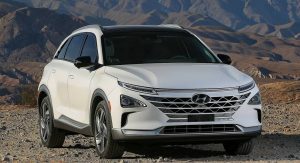 Hyundai didn’t mention any down payment, but the entry-level FCV features LED lighting units and 17-inch alloy wheels. 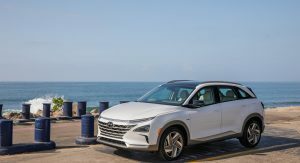 The Nexo Blue also comes pretty well equipped as drivers will find a leather-wrapped steering and heated power front seats with vegan leatherette surfaces. 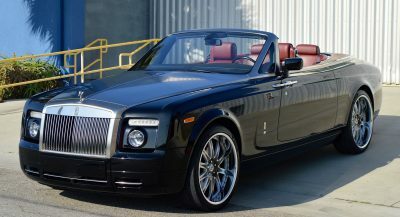 Other niceties include an auto-dimming rearview mirror, a dual-zone automatic climate control system, a wireless smartphone charger and a 12.3-inch infotainment system with GPS navigation. As with many other new vehicles, the Nexo Blue features an assortment of driver assistance systems. 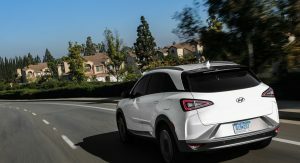 These include Forward Collision-Avoidance Assist, Blind-Spot Collision Warning, Blind-Spot View Monitor, Rear Cross-Traffic Collision Warning and Lane Follow Assist with Lane Keeping Assist as well as Departure Warning. 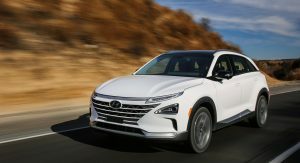 The luxury-oriented Nexo Limited is a tad more expensive as it costs $449 per month. However, it rewards buyers with heated / ventilated front seats, a heated steering wheel and an eight-speaker premium audio system. 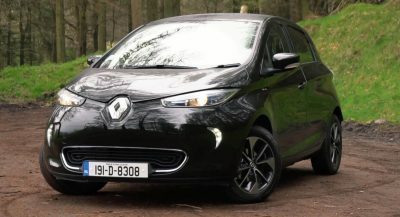 Other highlights include a power sunroof, parking sensors and 19-inch alloy wheels. Both models have a hydrogen fuel cell powertrain and an electric motor that produces 161 hp (120 kW / 163 PS). 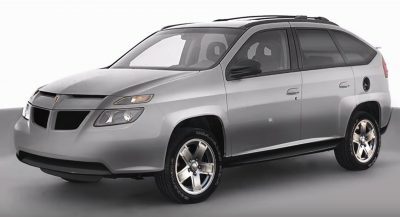 This enables the crossover to accelerate from 0-60 mph (0-96 km/h) in 9.5 seconds. 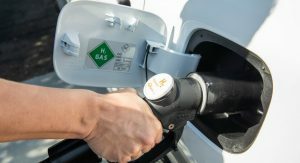 In terms of range, the Nexo Blue can travel up to 380 miles (611 km) before needing to find a hydrogen refueling station. 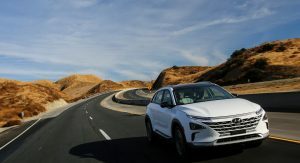 The Nexo Limited has a slightly shorter range of approximately 354 miles (569 km). I am not sure where the price comes from. 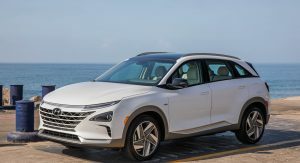 The quote I have for the car is $5K down and $489/month for 12K miles per year for the Nexo Blue. I guess the down payment and the # of miles / year could be different in the $399 / month lease that has been mentioned here. So it’s not mandated that a hydrogen-powered car trip the gag reflex? Yes, Toyota and Honda, I’m looking at you. 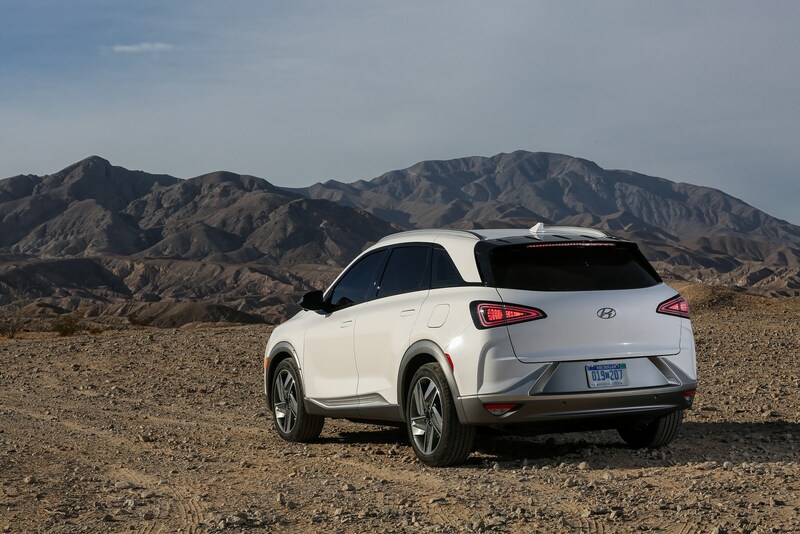 Hyundai continues to beat the competition. Still expensive, but fascinating. The interior is fascinating, that futuristic design and colors -for this segment- is better than anything I’ve seen so far. This thing is nice. It looks good even in the colors shown. It looks like a great alternative to what’s out there. Don’t care for the Nexo’s sheetmetal, but it’s still better than the Mirai’s. We shouldn’t forget who the leaders and innovators are. Toyota opened their Hydrogen Fuel Cell patents to all the car makers for free back in 2015. This allowed car makers to gain from Toyota’s years of R&D. 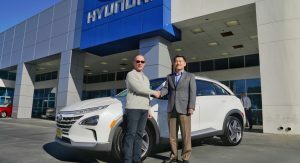 Yeah sure it’s easy for Hyundai to make a more affordable FC & apparently ‘better’ car, they didn’t pay for the R&D that goes with building the technology. 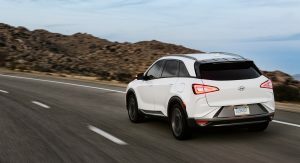 GM, Honda, Hyundai, etc. 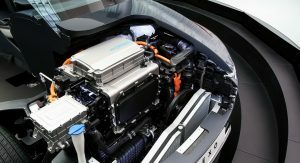 each all have their own fuel cell patents; which is why Audi AG partnered up w/ Hyundai. 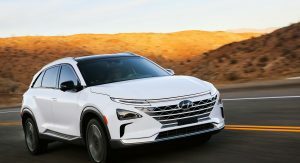 Plus, Hyundai has been doing fuel cells way before 2015. And that’s what is going to make them more successful. It’s not always about who was first. I just wish the front clip wasn’t so simple. It needs a few more lights and fake intakes.